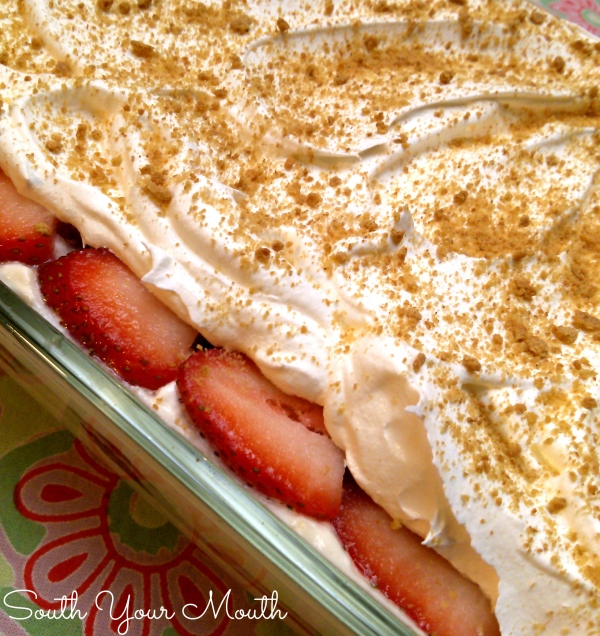 Strawberry Cream Cheese Icebox Cake! 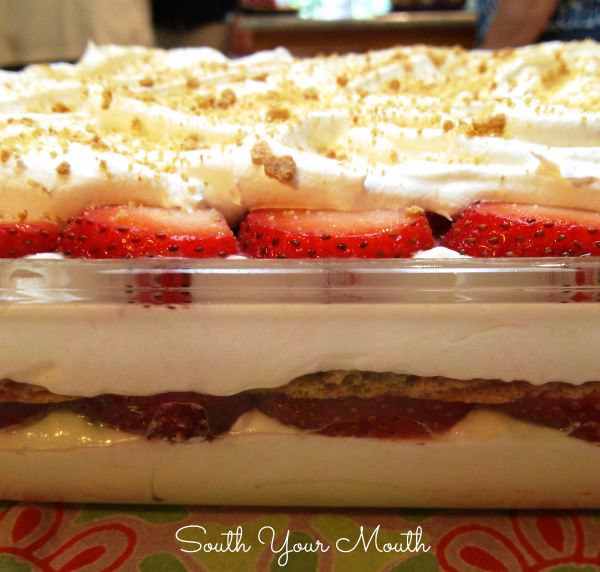 An easy no-bake layered dessert with graham crackers, cheesecake filling and fresh strawberries. From time to time I can’t figure out what to call stuff so I start asking people what they think. But it’s like picking out baby names. You have one you’re kinda leaning toward and the first person you ask is like, “Ugh, that was the name of the crazy old lady who lived across the street from me that smelled like mildew and beat my cat with wire hangers.” And you’re like, well there goes that name. The same happens with recipe names. You get, “Gross! No! That makes me think of boiled garbage!” And then you’re shocked because you really liked the name but now you can’t use it because now it makes you think of boiled garbage. I narrowed this one down to two options and very hesitantly asked on the facebook page which one y’all liked best. Turns out you like them both! And there was only a slight smattering of negative baby-name-changing type feedback. 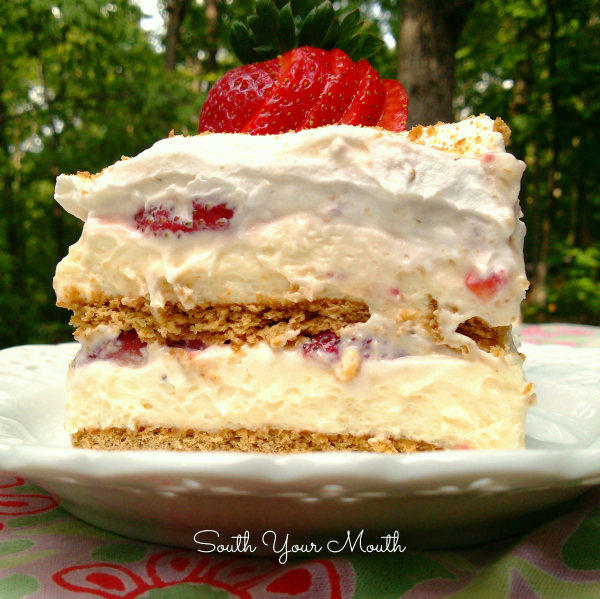 This recipe shall be called Strawberry Cream Cheese Icebox Cake hence forth and forever more. Probably. Unless there’s an overwhelming surge for the other option overnight. Or I change my mind. This is a layered dessert with graham crackers, a no-bake cheesecake filling and fresh strawberries. It's crazy easy to make so delicious! Enjoy! Clean and slice strawberries (about 1/4 inch thick); set aside. You have to do this first because the cream cheese mixture will start to set up quickly once it’s mixed up. Line the bottom of a 3-quart 13x9 baking dish with graham crackers; set aside. Mine easily fit 6 whole crackers then I had to break up a 7th one to fill in the rest. Combine cream cheese and sweetened condensed milk in a large bowl then beat with an electric mixer until smooth and creamy. Add pudding mixes and milk then continue mixing on low for 4-5 minutes or until mixture starts to thicken. Fold in 2 cups cool whip until smooth. Pour half of cream cheese mixture over graham crackers. Arrange a single layer of strawberry slices over cream cheese mixture. Top strawberries with another layer of graham crackers then cover with remaining cream cheese mixture. Top cream cheese mixture with another layer of strawberries. Cover and refrigerate for 6-8 hours. My strawberries put off a little moisture after sitting in the fridge all day so I soaked it up with a clean paper towel before topping with cool whip and graham cracker crumbs. You can use white chocolate or vanilla pudding if you can't find cheesecake flavor. Mmmmmmmmmmmmm! I bet this would be tasty if you subbed cherry pie filling (or any flavor of pie filling) for the fresh strawberries. Now how could we get some chocolate in there--kinda like an eclair? My mom had a special pie she made at Christmas that I now refer to Jennys Christmas Pie. You mix 1/3 cup fresh lemon juice with one can sweetened condensed milk, stir until.thickened, whip 1/2 pint of heavy whipping cream with 1 tsp. Almond Extract, fold into milk mixture and spoon into graham cracker crust. Top with cherry pie filling and refrigerate. I've made it wth cream cheese too and its luscious, but light. I've also used raspberry pie filling too. Yummers! There is one on Pinterest that is a Chocolate Eclair...it's really easy and good! you should try it! I've made this wire a few times, I mix my strawberries with strawberry glaze, its sooo good!! You could use blueberries and strawberries to make the American Flag on Fourth of July! There is a chocolate éclair cake that is basically the same just using vanilla pudding and you make the chocolate topping using cocoa powder. You should call this strawberry pudding! Like banana pudding with substitutes! I made it last night. Had some for breakfast today. YUM!! That is exactly where the idea came from!! Oh yeh...this is screaming my name (can you hear it?=) Thanks so much for sharing this lusciousness with us at Weekend Potluck. Pinning til I can make it soon. Very sad that we don't have cheesecake flavored pudding in Canada - or at least I can't find it here. Use vanilla! It'll still be delicious!! My birthday is today and I'm trying it TODAY!! Yay!! I am having a birthday/ bbq how many will this surve ? This will serve 20 polite people or 15 hungry! Thanks for sharing this at the Weekend Potluck. This sounds delicious! Pinning it to try later!! Thanks for sharing, gonna try this it looks amazing! I have been making this for years one difference I use strawberry glaze with my strawberries. I mix the strawberries and glaze together this gives it a more strawberry flavor plus keeps the berries fresh longer. Thank you for this yummy recipe. It was very easy to make and I really liked it. It's perfect in this hot weather since I don't have Air conditioning. No-bake is the best way. Carmen, that just means to gently mix until it's just combined so that it stays fluffy. This was so incredibly easy and so so delicious! Thank you! My son chose this for his birthday cake which means I won't be up half the night on a school night hopelessly trying to create a lego head, racetrack for Lightning McQueen, or a rocket cake. Part of me will miss those days as he gets older, but the part of me who still needs to work on lesson plans for next week while I watch the Auburn game we recorded is grateful for another wonderful recipe. Thanks Mandy! It is compulsory to use an electric mixer because I don't have one. So, would it still be possible if I used a hand mixer? Kindly advice me on this matter, thank you! Oh and the cake looks perfect! Why don't you just call it ... "That Yummy Strawberry Cheesecake Stuff"! Sounds about right to me! I'm from England, sorry but what is our equivalent to graham crackers and cream whip. Would love to make this it sounds delicious. Many thanks in advance. Oh my goodness. I fixed this for Church and some people are really picky everyone loved this. It is the best ever. Right, just add the dry mix. Anywhere from 12-24 depending on your serving size. OMG I can't wait to try this! It sounds delicious. Has anyone tried this with frozen strawberries? I used frozen strawberries last night and it turned out great (whole strawberries no sugar added). Sometimes you can find them already sliced. I made this for my son's birthday. My husband and I sneaked a taste this morning and it's so good. I can't wait for this evening to have more and I'm not much of a sweets eater. I will definitely make this again! Do you think it would be ok to make this the day before a gathering or does it really need to be made 6-8 hours before? I don't know what an alternative would be, sorry! I don't think you could leave it out either. Sorry I'm not much help! I wish you would place a picture with your receipts when we print the recipt! Instead of layering the graham crackers could you use a graham cracker crust? Thank you for this recipe. My co-worker loves strawberries and cheesecake so I made this for her birthday and everyone LOVED LOVED LOVED it. It was so simple and easy to make. My new fave dessert to make for all potlucks. I made this for my Bunco group which was Monday night, I made it Sunday afternoon... let me just say it is DELICIOUS!!! Everyone raved about it and wanted the recipe!!! ok this seems like it deleted my message so ill ask again, my cool whip i made from scratch turned out amazing but the other mixture was very liquidy and never thickened , was it possible that 3 cups of milk was too much or did i do it wrong? it didnt even thicken after i added the cool whip...any ideas? 2 packs of instant pudding would thicken just about anything. Even if it were thin for some reason when you first made it, it would thicken up as it set. I don't know why this happened. Is it possible you bought cook-and-serve pudding? Ah ha! You fixed that exact problem....thank you! Cook-&-Serve is exactly what went wrong. Thank you for problem solving for me! Oh my!!! I looks yummy. Made this last night for hubby & he loved it! Going to make it this summer for a family cookout & try bananas with chocolate pudding & blueberry with vanilla pudding, Also, going to do 2 layers of graham crackers on bottom just cause I like them! Made this for our Church dinner and our eat in at worked. I took home an empty pan both times. Everybody loved it. I made it low fat to by using fat free and lite items. Turned out great and they were surprised it was low fat. Wondering if anyone made this ahead of time (like the night before) or if it needs to be 6-8 hours? I would think so but I don't know for sure since I've never used it. I could only find the fat free/sugar free pudding mix. Can I use this kind or do I need the regular cheesecake pudding mix? I found the regular pudding mix! Yeah!!! But if anyone has used the fat/sugar free, let me know if it works. Thanks. I used the fat free/sugar free pudding, fat free condensed milk (I won't say the brand, but you know.. the best condensed milk brand) and also used Organic Skim milk. I cut the milk to 2 cups though as skim is quite thin. Anyway, it set up perfectly and is YUM YUM YUM!!!! My granddaughter and son absolutely loved it! It was not as heavy as I thought it might be. Will be making again for sure; it's a breeze! Thanks! My family loves strawberries and cheese cake. They should love this! Thanks for sharing! Delicious! Had to tweak the recipe because our store did not have any 3.4 ounce boxes of the instant cheesecake pudding filling, only small 1 ounce boxes and it was the fat free - sugar free version. I used two boxes (2oz.) and it still set beautifully. Was worried that the fat free- sugar free version might give it a weird flavor but it didn't! Also, we skipped putting the last layer of whipped cream on the very top after it set. I just decorated the last pudding mixture layer with strawberries and blueberries for a fourth of July look. Everyone loved it! Thank you for such a yummy recipe! We are not fans of Cool Whip.. could I use real whipped cream or would it not hold up? Thanks for your help! I have the same question as a person above. I prefer making my own whipped cream insead of using cool whip. Would that still work? Has anyone tried that? I love this recipe, I made it for my Mother and Sisters for Mother's Day. It turned out perfect. All your recipes looks delicious. You, post the kind of food that is worth gaining a pound or two. Keep doing what you are doing. Are you on TV? If not, you should be, because you are great. I've had this recipe for months and finally made it. This is bomb!!! Thank you for posting it, I'll be trying all your recipes. Since my hubby also likes banana cream pie, I'll use the same recipe and substitute bananas for strawberries and banana flavored instant pudding instead of cheesecake. OMG this was fabulous! I made it for a coworkers birthday - he loves strawberries. With it being Dec I was worried about buying strawberries but luckily the ones I bought were awesome! Anyway, everyone in my office loved it! I def recommend this recipe! Oh this is so good. I've made it so many times for so many audiences and it's always a hit. I even made it for Christmas and I basically had to do surgery on the out of season berries to make them edible but it was oh so worth it. Thanks for a treasure of a recipe! I've made this before and used crushed golden oreos, instead of the graham crackers. I haven't found anyone that doesn't like this dessert! Absolutely delicious dessert! Made this with my niece, who is very interested in cooking and baking, for a family gathering. Perfect for these hot days we've been having. We didn't have to turn on the oven! This is the best recipe EVER! It has become my signature dish I bring everywhere and is ALWAYS a hit! 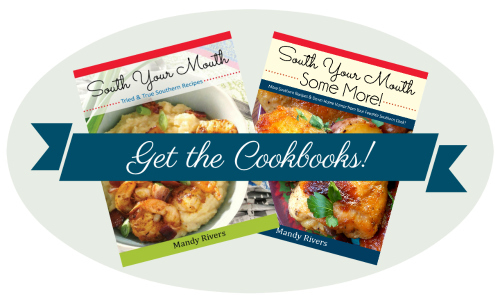 Thanks for the wonderful recipes you provide! This is a great recipe if you're looking for something that's light yet tasty. I follow the recipe to a T with the exception of using an envelope of strawberry glaze. I mix the strawberries and glaze together and layer as directed. It may be too much for some but I've found that if your strawberries don't have that natural sweetness, the glaze helps. I made this for a church Guest Day. I made it the afternoon before that day and kept it in my refrigerator. When it was cut, it was so soft that it just slid into a pile on the plates. It didn't look pretty at all! I was embarrassed! The taste was good but so rich that the regular sized piece would be too much for one serving! All in all, I am going to throw this recipe away! OK, all better now... I've made this dessert more times than I can count and I've never run into any issues at all. A few things come to mind that could have gone wrong, though. If anything other than instant pudding was used (2 pks), if the pudding was prepared instead of using the dry mix, if any ingredients or quantities were changes, if the strawberries put off more moisture than normal or if the dessert wasn't kept nice and cold, things might not have set up properly. I've always eaten and served mine 6-8 hours after making (per the recipe) so maybe this isn't a good recipe to make the day before. So happy to hear that you thought the taste was good! But hate to hear you thought it was too rich for one serving. I don't blame you, though. If I had this much trouble with a recipe, I'd throw it away too. I hope the next one you choose works out better for you! I'm lactose intolerant so i used sweetened condensed coconut milk (available online or at some healthy grocery stores) & 2% lactose-free milk. It came out so yummy with a little tropical coconut taste that went well with the strawberries. Thank you for the recipe! I was thinking the graham crackers might become soggy...so I plan on doing a graham cracker crust.